how to make a rocking horse a new and more engaging experience? A rocking horse is one of the oldest typology of toys since ever. It has been decorated exclusively, upholstered with care, made in many different materials. But the wooden one definitely embodies the stereotype of this toy that has been the fun of kids since the 17th century. With such history it is quite a challenge to innovate it, and this is something I love. Sometimes it is interesting how intuition plays a critical role in innovation. The spring effect given by multi-layered wood was the key for a functional innovation that did not touch the natural look of the wooden rocking horse, instead increasing its identity and making it contemporary. Multi-layered wood also allowed me to summarize the constructive elements into just one, simple and clean as the original intuition: an S-shaped element that recalled the horse chest in the front and the paws on the back. This very graphical constructive element has been the first step for the rest of the design challenge ahead: bring the whole toy into a light, clean and modern look. The result is a very dynamic identity that recalls very much a flight, just like the best experience of gallop should be! That is why the saddle with its pockets reminds the shape of two little wings and the horse is called Icaro, the name of the mythological greek hero that built wings to escape the labyrinth. Another important goal for the project was to enhance lyfecycle performances, to make Icaro a long-time play companion rather than a toy for a narrow age spectrum. I felt the spring effect had a very good potential for entertainment in the early months. Moving back and forward, up and down.. it was the hint for further development. The first intent, in order to lower the target age, was to reduce the movement to reduce risk and also make it more stable and safe. We found it could be used as first chair by mounting the rocker base the other way up. 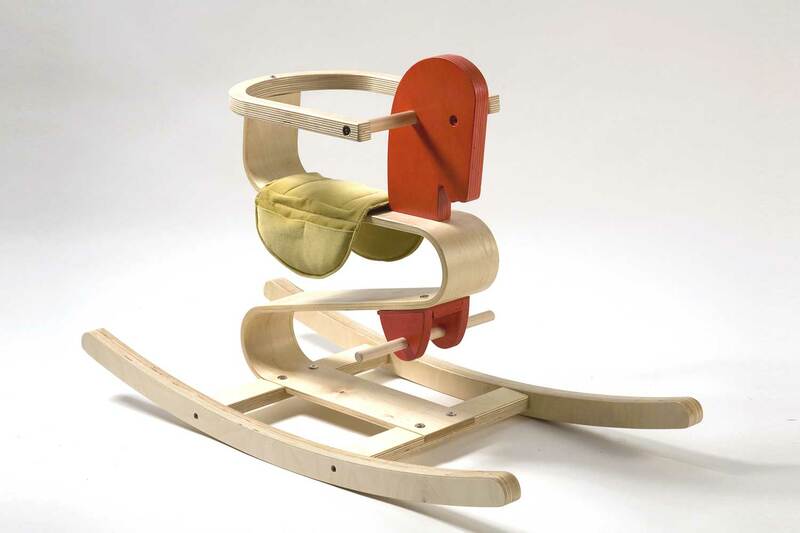 At the same time we made the side protection removable, so the rocking horse could also be used by older kids.